ANSA has reported briefly on the press meeting with Francesco Rutelli ("E' a Roma il vaso di Eufronio", January 18, 2008). 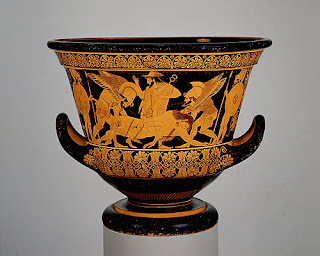 Silvia Aloisi, "Italy hails return of ancient vase from New York", Reuters, January 18, 2008. A few hours after Friday’s ceremony, the krater was transported to the state television network, RAI, and paraded on an evening broadcast, with the culture minister and a news anchor sitting proudly nearby.